A magnitude 6.6 - 139km E of Kimbe, Papua New Guinea is the 4th major quake in the last 2 days. Earlier this morning a magnitude 6.4 struck Indonesia and yesterday two magnitude 6.3 quakes were reported by USGS, the Southeast Indian Ridge under Australia and Papua New Guinea being the recipients. 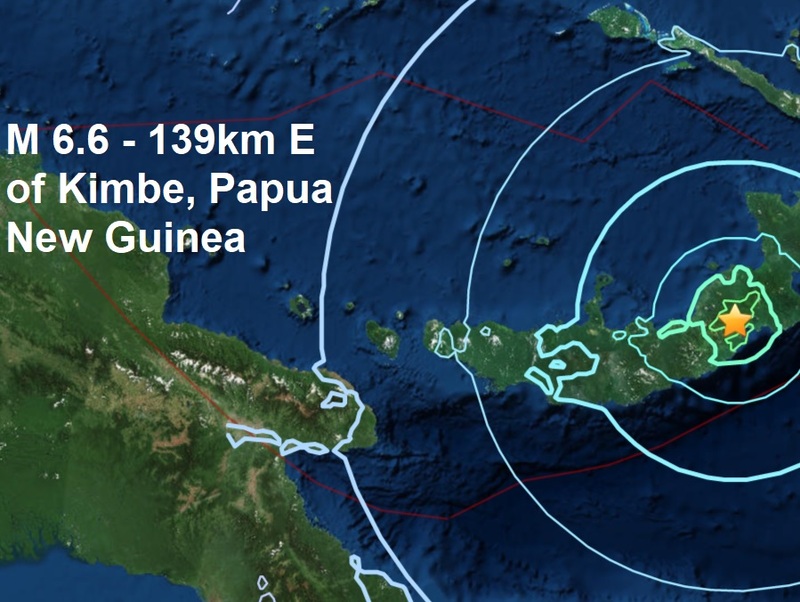 Incredibly 11 of the 30 major quakes this year have occurred in or around Papua New Guinea. Today's major quakes were the 6th and 7th of March and brought the total to 30 in 2018, 13 more than the same time period of last year. Of the 30 major quakes reported this year, 29 of them have occurred during coronal activity on the sun. NOAA forecasters estimate a 45% chance of G1-class geomagnetic storms today, March 26th, as a stream of solar wind blows around Earth. The gaseous material is flowing from a southern coronal hole in the sun's atmosphere.